I’ve seen several beautiful photos recently that were nearly ruined by the fact that sharpening produced halos where sky met edges. What’s worse, the photographer could have easily removed them in Photoshop. With less than a minute of work, those halos could be gone. Here’s an example that illustrates what I mean. I made this photo of a rock climber in Arches National Park. It’s a nice photo but if you zoom in, you will see the halos I’m writing about. After sharpening the image, I was left with a halo around the edges. Wouldn’t it be nice if you could simply take the clone stamp, select from the sky and paint the halo out, without affecting the rock? The good news is that’s exactly what you do. To get rid of those halos, (make sure you are working on a flattened or composite of your image) you simply change the blend mode of the clone stamp from Normal to Darken. The Darken blend mode tells Photoshop to replace pixels that are lighter than the selected area with pixels from the selected area BUT, only replace pixels that are lighter than the selected area. So long as the selected area is lighter than the adjacent rock, only the halo will be replaced. Notice how the halo disappears without leaving any telltale signs on the rock. Brush size doesn’t matter, just make sure that opacity is set to 100%. Unless you are very careful, your cloning can leave you with areas where the sky doesn’t match properly like in the image below. Change the blend mode of the layer to Darken and use the clone stamp to eliminate the halo. (It doesn’t matter what the blend mode of the clone tool is.) If you get mismatching sky, fix it using a gaussian blur. Make sure the new layer is selected, click on Filter >> Blur >>; Gaussian Blur and apply enough blur to fix the problem. The blur will only be applied to the layer you were working on. It, of course, will only have the data from fixing the halo so you won’t cause yourself any other problems with the image. Halos can ruin an otherwise great photo. Fix them quickly and easily in Photoshop. Photographing a speeding locomotive from the tracks in front of it is dangerous business; too dangerous for me. So, how did I make this photograph? While, not simple, I created a composite using an image of the mountains I had made in Glacier National Park, another with colorful foliage in Alaska, railroad tracks that I photographed in Granger, Texas and a locomotive I photographed in my kitchen. That’s right, I photographed it in my kitchen. You see, my friend Jim Doe creates remarkable models of all kinds of things and he let me use his BNSF locomotive. It is so lifelike that no one would know it isn’t the real thing. I loaded all those images into Photoshop and went to work. This composite was the result. Who would think that the train in this photo is a model? I don’t know. It looks real to me and creating this image was completely safe. I’ve heard it said that photographers should just delete any bad images as they come out of the camera. If it isn’t good now, they say, it won’t get better with time. There is a lot to be said for that, but I keep all my images. I will go through old images once in a while and in doing so, I’ve uncovered some that I didn’t think were keepers at the time. I’m sure I discarded one image of some gannets in New Foundland because the tip of the wing was cropped off. Otherwise it was a really nice image. My Photoshop skills have reached a point where I knew I could recreate the wing tip. So I fixed the wing and printed the photo. It won a second place in a local photo contest. Sometimes when I look through some of my old photos, a Photoshop idea pops into my head. Look at the four photos below. None of them are “keepers” by themselves, but when I composited them in Photoshop, I think I produced a pretty good “altered reality” image. In fact, I am very pleased with the final image. Scroll down to take a look. When I set up my camera and tripod in anticipation of making a photograph of this beautiful valley in Iceland, I hoped for something better than I ended up with. The sky was mostly cloudy but the sun would peek out through an occasional break in the clouds. As portions of the valley lit up, I would make an exposure; all the time hoping the sun would light up the mountain at the end of the valley and that a blue hole would open behind it. Unfortunately, the sky simply did not cooperate and this was one of the photos I was able to make. While this photo is acceptable, it wasn’t what I was looking for. Before I packed it in, I raised my camera, and using a wide angle lens, captured the scene with the blue hole that was high in the sky. That photo wasn’t very good because the blue sky wasn’t where I wanted it in the frame, it had too much sky and the valley was completely shaded. As I made my photographs, I was thinking about whether I could make the shot I wanted in my post processing by combining the images that I had made. When I got home I gave it a try. First, in Adobe Camera Raw, I opened twelve images I had made of the valley; all with different places lit by the sun. I made my adjustments,made sure that I had selected all the images and applied the adjustments to all of them. I then clicked on the “Done” button. With those same images selected in ACR, I clicked on Tools, Photoshop, Load Files into Photoshop Layers. When all the files were opened, I selected all the layers and changed the blending mode to “Lighten”. By changing the blending mode, all the lightest pixels were exposed so the entire valley was lit up. I liked the final product much better, but all the shadows were now lost. I then clicked on the eyeball next to each layer to see what it was contributing to the entire image. By turning off some of the layers, I was able to bring some of the shadows back into the image. When I found the combination I liked, I flattened the image and the result was much better than the original. Still I wasn’t satisfied. I then pressed CTL ALT SHIFT E to flatten the layer above the other layers. I converted it to a smart object and applied select filters from Nik’s Color Efex Pro 4. I then used Nik’s Viveza to make some targeted adjustments to the mountain top, adding the light I had hoped I would get from the sun as well as adding a little saturation. While I captured the light I wanted via stacking and getting the sky I wanted by compositing the sky from a photo made during the same stop, I still wasn’t completely satisfied with my shot. I liked everything about it except the foreground. I thought it needed more or none at all because I thought that what I had was more of a distraction than a photographic element. I looked through my images and found another one I made at the same location but at a shorter focal length. I was able to move the foreground from that image to my stacked image and it worked well. This is the image I set out to create. When the sun and sky didn’t cooperate, I took what they gave. When my eye didn’t capture the best foreground, I inserted the foreground from another image. In the end, I created the image I was after. I enjoy making photos of the night sky, especially when the Milky Way is clearly visible. I usually try to shoot on clear moonless nights because I find that a moon produces too much light. Even a quarter moon lights up the sky and, as a result, dims the stars. Of course, the problem with shooting the night sky with so little light is that in order to light up the foreground, a long exposure is required. An exposure long enough to light up the foreground is too long to capture pinpoint stars. I photograph the night sky with a 14mm, 21mm or 24mm lens which means that I usually keep my exposures to 25 seconds or less. Anything longer than that will produce unacceptable star trails. Now star trails can make very nice photos but the exposure needs to be more like two and a half hours. A dark foreground can’t be captured satisfactorily in 25 seconds. Using Photoshop to increase the exposure for the foreground can work, but there is simply too much noise to make the shot acceptable. Compositing the two shots in Photoshop is relatively easy so long as the foreground isn’t too complicated. Here is he final composited image. Waterfalls are one my favorite photographic subjects. I like to use slow shutter speeds to capture that flowing silky look. To do that, I try to use a 1/2 second exposure. If the water is flowing fast, a slightly faster shutter speed will accomplish a satisfactory result, but when possible I stick to a half second. Unfortunately, such a slow shutter speed may eliminate a feature that a faster shutter speed would have caught. Look at the two photos below. The one on the top captured the look I wanted and while I like it a lot, one thing I liked about this waterfall was the foam that it created in the pool. A close look at the next photo reveals that I captured the detail in the pool that is missing from the the photo on the top. So does that mean I can’t have the best of both worlds? Not at all. Combining the best features of both photos is easily done. Here’s how. In the field, you must use a tripod to capture the waterfall using different settings. It is important to get the exact same composition for each photo. That’s why a tripod is a must. For the photo on the top, I used a shutter speed of 1/2 second. For the other one, I shot at 1/60 second. When shooting at slow shutter speeds, you will be using small apertures, like f-16, f-22 or even smaller. Small apertures will keep everything in focus. I made top image using an aperture of f-22. The lower shot was made at f-8. While everything in it is in acceptable focus, the foreground on the top photo much sharper. Once you have your photos, open both of them in Photoshop. Click on Window, Arrange, Tile All Vertically. Photoshop will place both photos together on your screen. Click on the photo with the attributes you like most. (In this case, the top photo.) We’ll call it photo 1. Then press and hold the CTRL key, then press the J key. That will create a duplicate layer. Then select the Move tool. Using your mouse, grab the layer and move it over photo 2. Then press and hold the shift key and release the layer. Using the shift key will perfectly align that layer from photo 1 over the photo 2. When you’ve done that, close photo 1. Now click on the add a layer mask icon. Here’s where the magic happens. Use a soft brush and set the opacity control to about 30%. Use it to paint over the area of the pool where the bubbles and foam are on the layer below it. Paint until you get the effect you are looking for. Here’s my final photo. I like to photograph the night sky on clear, moonless nights when the only light comes from the canopy of stars. I also like to create composites for my final image. To do this I make exposures of about 3 minutes for the foreground and 25 seconds for the sky and combine them in Photoshop. Unfortunately, even on the darkest nights, the camera will capture the orange glow of a distant city. 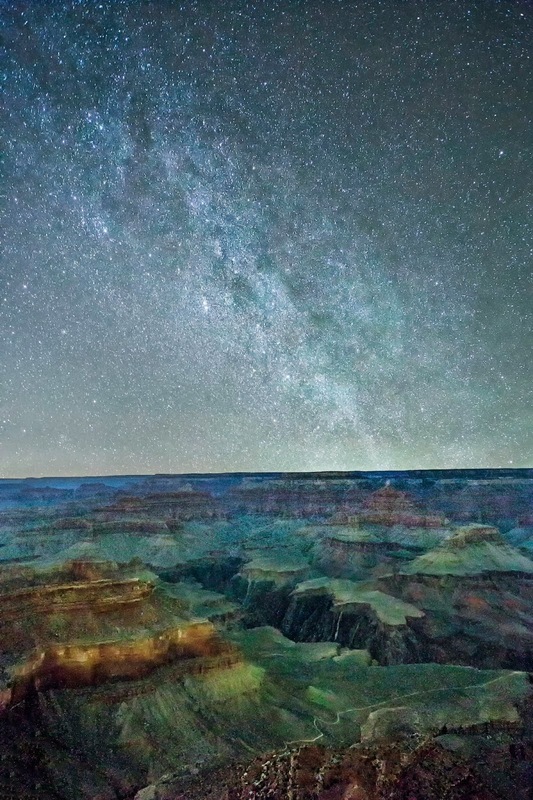 The photo below, made from Yavapai Point at the Grand Canyon was exposed for three minutes. 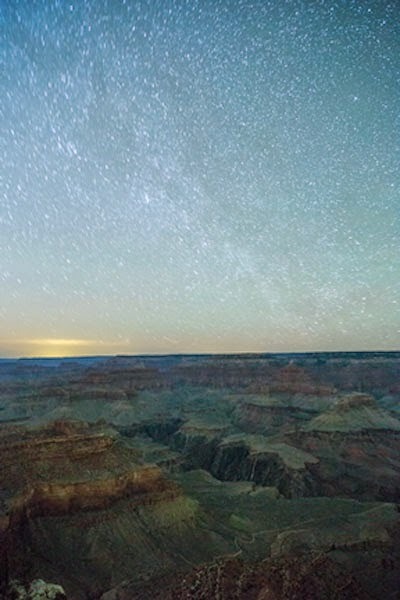 Notice that the canyon is properly exposed but the stars are forming trails because of the long exposure. Notice the glow in the sky just above the horizon on the left. It comes from the City of Las Vegas which is 175 straight line miles away. 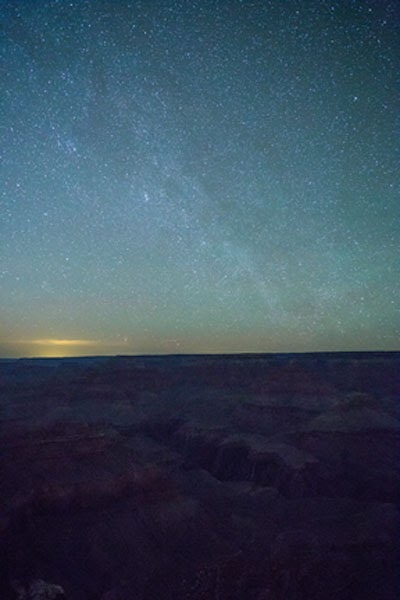 Here, the sky is exposed for the stars but the canyon is underexposed. The glow from Las Vegas is still clearly visible. I combined the above two images to make this composite. Here’s how I did it. First, I opened both photos in Adobe Camera Raw and made various adjustments. What they were is really not important because this article is about creating a composite from two images. What is important is that I made the same adjustments to both images. I’ve found that making separate adjustments for each layer tends to make the composite look fake and fixing it is more difficult than just using the same adjustments. I opened both images in Photoshop. I made a copy of the image with the properly exposed foreground (CTRL J) and using the move tool, placed it as a layer on top of the image with the properly exposed sky. Using the quick selection tool, I made a selection of the sky. Because the intersection of the horizon and the plateau is virtually flat, the quick selection tool did a great job. With the sky selected, I held down the ALT key and clicked on the create a layer mask icon on the Layers pallet. That created a black mask which hid the selected the area on the top layer and revealed the selected area on the bottom layer creating the perfect composite. But what about the glow from Las Vegas? Here’s how I fixed that. I simply selected the sky layer and then chose EDIT, TRANSFORM, SCALE and dragged the handle at the bottom corner to make the sky layer larger. I then used the move tool to move that layer down until the glow was below the foreground layer. With the original foreground selected and making sure I had selected white as the foreground layer, I clicked on the add layer mask icon. This action revealed the sky of the transformed layer. It was a simple matter. Because the sky layer is larger, you can also move it from side to side to get that layer in the best position. Is there a downside do using Transform? Yes, it has the effect of using a longer lens so the slight trailing in the stars from the 25 second exposure will be a bit larger but that will only matter if you decide to print an enlargement of your photo. But even then, depending on your camera, the effect will be minimal.